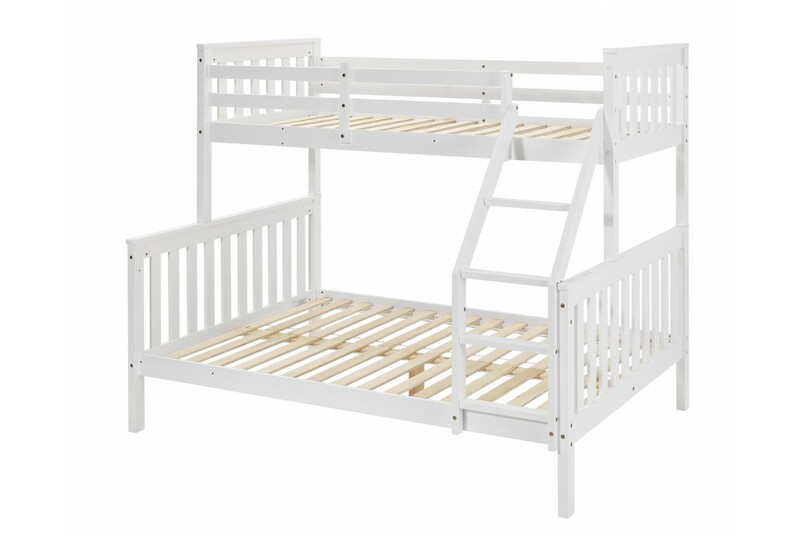 The 'Oscar' Solid Wooden Pine Triple Sleeper Bunk Bed by 'Sleep Design' is a fantastic space-saving solution for smaller rooms or for larger families. 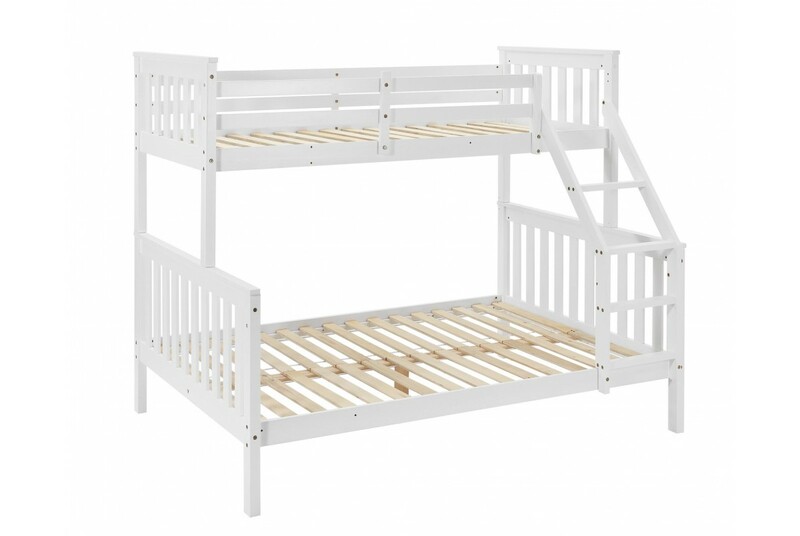 The 'Oscar' Triple Sleeper bunk bed is constructed from solid pine wood & finished in subtle white. The upper bed is surrounded with substantial guard rails and is accessed by means of a ladder which can be fixed to the side of the bed. 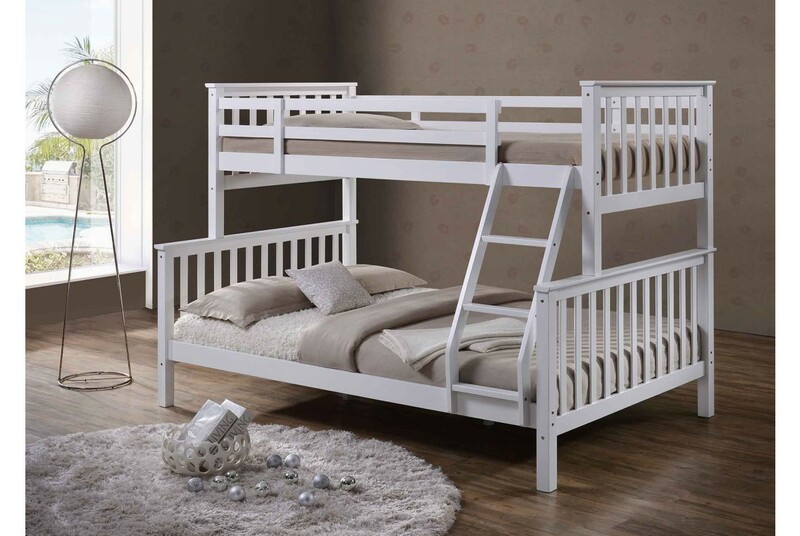 A unique feature of this triple sleeper bunk bed is that it can be split into two separate beds (Single & Double) if required. 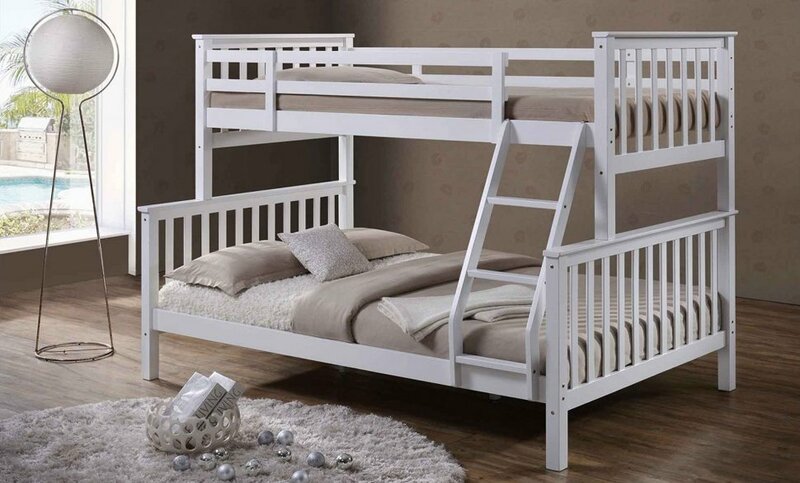 An absolutely outstanding quality solid & sturdy bunk bed at an unbeatable price! 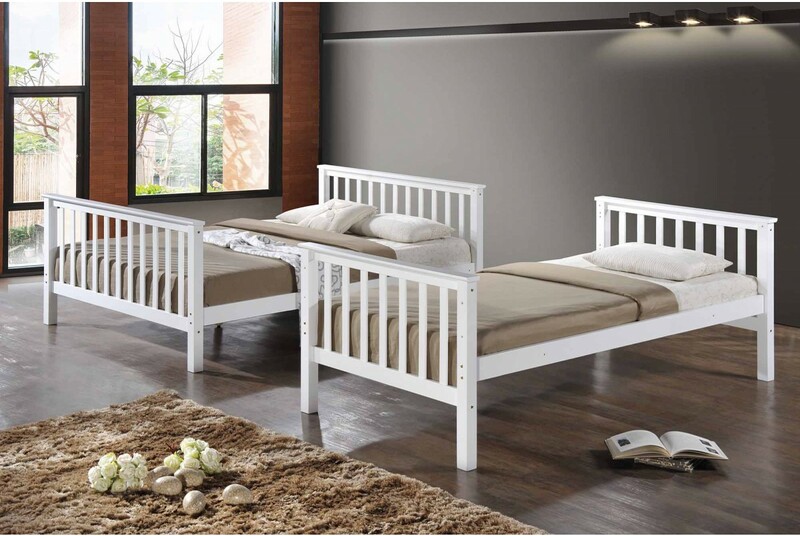 This is an award winning bed of the highest quality & available at a 'Crazy' price! This is an exclusive 'Sleep Design' branded product. 'Sleep Design' was created over ten years ago with the intention of bringing the latest innovative designs & fashions to the UK public at an affordable price, a good quality & efficiently. 'Sleep Design' achieve this by working closely with & purchasing directly from manufacturers in volume, cutting out any middle men or unnecessary costs. 'Sleep Design' work with only a handful of trusted retailers who sell these products directly to the public at rock bottom prices. Many competitors have tried to copy this model as well as copy the product designs but 'Sleep Design' remain the number one brand within its market. Beware of all cheaper imitations! Why not add a mattress to your order that will go perfectly with your new bed. We offer 3 great options. At Dream Warehouse we do not offer 'budget' mattresses. Our Mattresses are manufactured with quality in mind ensuring you a good nights sleep. There is no extra delivery charge when adding a mattress. Add a 15cm deep 13.5 gauge Orthopaedic mattress with a layer of felt and foam that surrounds the entire mattress. The mattress is supplied with a velour mattress protector. We consider this mattress to be a top of range orthopaedic mattress that represents great value for money. These mattresses have a 'medium' feel. Add a 20cm deep luxury Sleep Design memory foam mattress supplied with free Coolmax removable and washable cover. This is amongst the best selling mattresses in the UK. It has been tested by SATRA in the UK and complies with all UK Fire regulations. Comes with a 10 year guarantee. These mattresses have a 'medium-firm' feel. Add a 25cm deep luxury Sleep Design Memory foam top of the range Mattress supplied with a free Coolmax removable and washable cover. This is the ultimate sleeping experience and amongst the best memory foam mattresses available. If you want a luxurious mattress this is the mattress for you. This mattress has been tested by SATRA in the UK and complies with all UK Fire regulations. Comes with a 10 year guarantee. These mattresses have a 'medium-firm' feel. 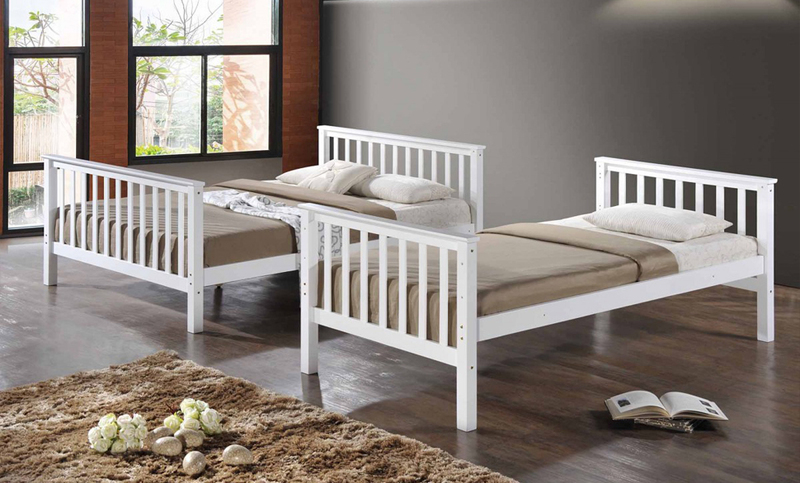 These mattresses will fit perfectly in this bed and give you the perfect night's sleep. No additional delivery charges apply. To place an order please choose the 'add mattress option' when prompted.